Kinder Morgan's Trans Mountain project loading dock is seen in Burnaby, B.C., on Nov. 25, 2016. The House of Commons is in the middle of a two-week break, during which times cabinet rarely meets. But ministers are hightailing it back to Ottawa to try and salvage the pipeline project they green-lighted 17 months ago. 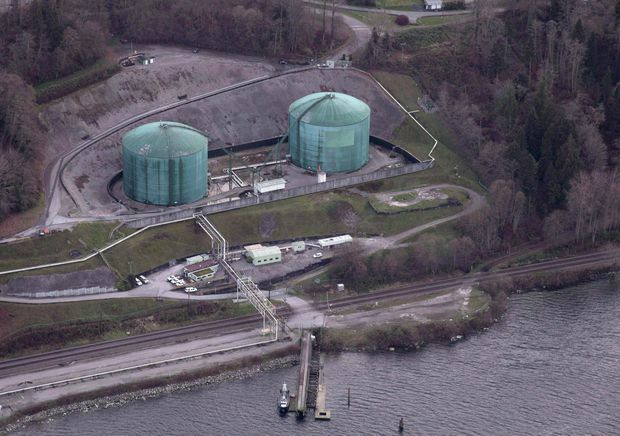 Kinder Morgan announced late Sunday it was calling a halt to all non-essential spending on the project, giving Ottawa a deadline of May 31 to convince the company and its investors that the pipeline can prevail over the opposition that now threatens to block it. The fight between B.C. and Alberta escalated Monday as Alberta Premier Rachel Notley promised legislation this week that would, once passed, give Alberta the ability to reduce domestic oil supplies into B.C. Such a move would cause already high gas prices in B.C. to spike, ramping up the pressure from pipeline proponents on the province to back down. B.C. Premier John Horgan, however, heads a minority NDP government that clings to power only with the support of three Green party members under an agreement to fight the pipeline. So far, he’s shown no sign of giving in. The pipeline is within federal jurisdiction, but Horgan is trying to use provincial powers to limit how much oil – ultimately destined for export markets overseas – can flow through it, effectively killing any reason for expansion. Notley said Monday she expects the federal government to follow Alberta’s lead and put economic and fiscal pressure on B.C. to back off. She also wants Ottawa to use the courts or legislation to assert its jurisdictional authority over the pipeline, and to put its money where its mouth is – either as insurance for worried investors or even as a stakeholder in the project. Legal, regulatory and financial options are all being considered, Natural Resources Minister Jim Carr said Monday. And Prime Minister Justin Trudeau described a long conversation Sunday with Horgan in which he told him not to intervene in an area of federal jurisdiction. The expansion project is meant to triple the capacity of the pipeline that already runs between Edmonton and Burnaby, B.C. Opponents to the project in B.C. say the pipeline can’t go ahead if Canada is to meet its climate change targets, and also fear the expanded risk of oil spills and heightened oil tanker traffic off the coast of B.C. “It is the job of the prime minister to lead and to demonstrate exactly how his approved expansion will not keep facing blockades and barriers and delays,” Stubbs said. Earlier this year, Carr and Trudeau both said they would not stand for undue delays, but so far have done nothing to back up their words, she added. The Conservatives also want Trudeau to sit down with Horgan. The prime minister was in Victoria last week, but Horgan was away in Kamloops; the pair haven’t sat down in the same room since last fall. Melanee Thomas, a politics professor at the University of Calgary, said provinces have very little legal ability to force other provinces to take action. She said Notley’s plan to give Alberta the ability to restrict B.C.’s oil supply may not be constitutional, but likely can’t be challenged unless and until she actually goes through with it. “There isn’t really a court challenge there until they pull the trigger, but it’s still ratcheting up the fight,” said Thomas. Brian Lee Crowley, managing director of the Macdonald-Laurier Institute in Ottawa, said the federal Liberals are up against the wall – they have alienated some of their environmental supporters by backing the pipeline, and could end up with nothing to show for it. Crowley called it a “no-win situation” for Trudeau politically, but one that may be beyond politics now.